Ariya Jutanugarn tees off on the third. At the LPGA Volvik Championship in Ann Arbor, Ariya Jutanugarn is still on track to win her third straight LPGA Tournament. She holds a one shot lead over Christina Kim and Jessica Korda. Jutanugarn had a tough round, falling behind after four bogeys in thirteen holes. An heroic eagle on the final hole, however, lifted Jutanugarn back to the top of the leaderboard. On par five eighteen, Jutanugarn followed her three wood off the tee with a three iron from the fairway. That set up the fifteen foot eagle putt. “They move the tee box, so I have chance to go second shot iron, so I miss my first shot in the rough and second shot 220, and I hit my iron, and here I didn’t hit that good, but come pretty close to the pin and I make the putt,” Jutanugarn explained. Kim and Korda each birdied the eighteenth. Ariya Jutanugarn plays out of the woods enroute to a bogey 6. After two pars to begin her round, Jutanugarn took a bogey on the par three third. The wheels came off on the par five fourth. Her tee shot went into the treeline, forcing her to chip out. Going for the green, Jutanugarn fell just short and had to drop. Jutanugarn managed to get out with just a bogey. Bogey was again the score on nine and thirteen. Then Jutanugarn righted the ship with a birdie on the uphill par five fourteenth. The top of the leaderboard is crowded with golfers with a winning track record. Korda and Kim are one shot back. Suzann Petterson and Hyo Joo Kim, who also have multiple titles are three back. 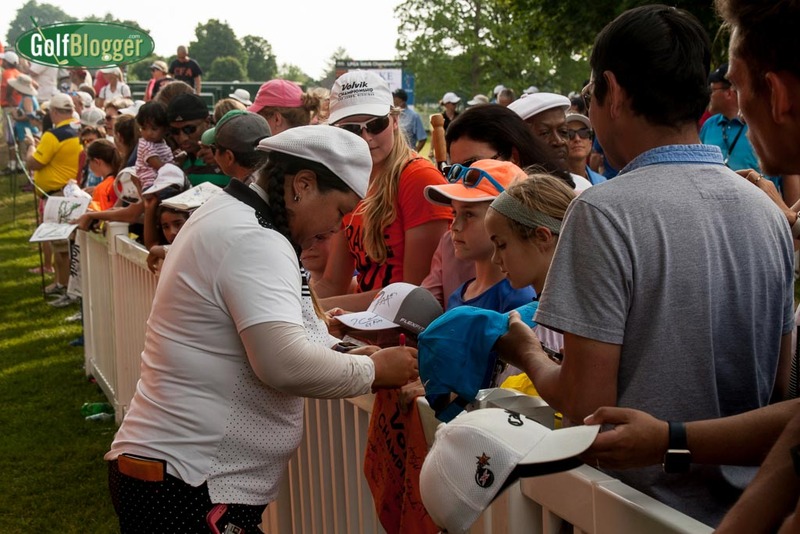 Christina Kim signs autographs following her round of 72. Christina Kim said that Travis Pointe was playing much tougher on Saturday. You know, I think any — it’s the wind, you know, this south/southwest wind. It’s angled perfectly where there’s a lot of into, off the left, or downwind off the left, you know, as opposed to just dead into or straight from nine o’clock or three o’clock, and I think that, you know, it just really brings up a lot of the great characteristics of this golf course. The fairways wind, the greens have a lot of — a lot of subtle complexes to them, and it’s such a great golf course and obviously you can see all the fans are out here and everyone is all about go blue and — (cheering). You can tell the staff here at Travis Pointe Country Club has done some tremendous things to host us here, you know, whether it’s the food, which has been the best we’ve had all year long, the hospitality of everyone, all the fans, obviously, have been great, but you can tell for a first-year event this thing is top, top class. Ann Arbor native Jennifer Song carded a two over 74, and is tied for 32nd. The highlight of her round was a birdie on the par five eighteenth. Song is scheduled to tee off at 10:45 am. On Sunday, Jutanugarn will be paired with Korda in the final group. 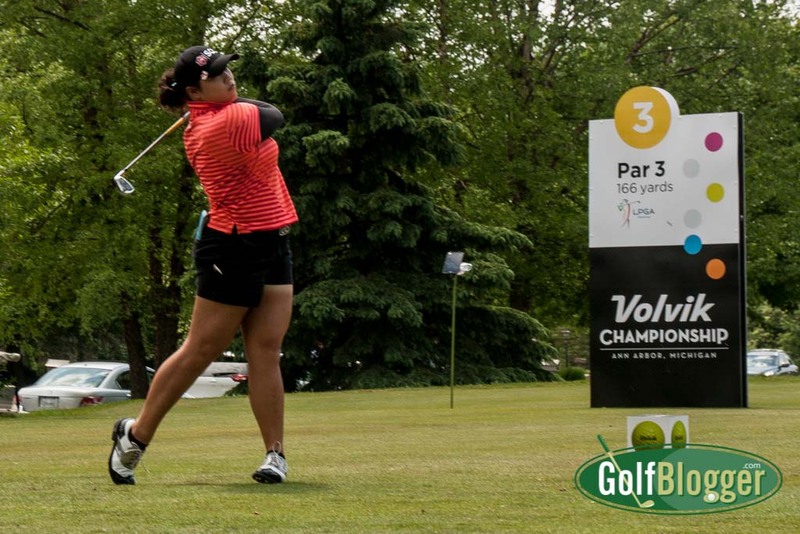 Christina Kim will play with Hyo Joo Kim in the penultimate group. Play will begin tomorrow at 7:15 a.m. off the first tee with the leaders going off at 1:45 p.m..